I find myself in the unusual position of agreeing with Lindsey Graham this time. I was fairly pleased with the President’s speech last night. I watched both the speech and Graham on Fox afterwards. For those who support Trump and feel that he betrayed them by not pulling us out of the mess in Afghanistan, you need to realize that realistically he couldn’t pull us entirely out. I believe he made the right choice, the only one really workable here. As I see Afghanistan, we had three choices. The first is entirely pulling out. If you did that, just as in Iraq, Iran and the Caliphate will rush in to fill the void. You may not care about that, but you should. Even if we say we aren’t at war with radical Islam, it doesn’t mean they aren’t at war with us. Left to themselves, they would spread across the globe like an unstoppable cancer and the next attack on us will make 9/11 look like a walk in the park. The second is to use contractors and limited military personnel to hold the line. That doesn’t cut it for me and won’t stop the Islamists. The third is overwhelming planned force, which is what I suspect the Pentagon is game planning. President Trump is not going to micro-manage the battlefield from the White House. He is wisely turning this over to his generals and he is taking the insane Obama restrictions off our military. It has been working with ISIS and now it will get its chance with the Taliban. I don’t want war, never have… but you can’t act like Rand Paul and just say pull out and come home and then pretend they won’t eventually come for us. That resulted in the last 9/11, so spare me. Ted Cruz is supporting the move: “My hope is the President will listen to the counsel of the Generals, the Admirals and Military leadership on how to win the war and defeat radical Islamic terrorism.” That was before the speech. 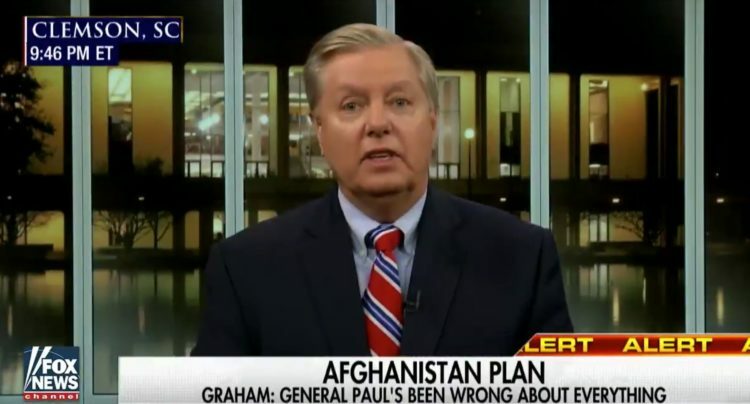 Graham was also right when he stated that he doesn’t think Congress has to vote on the new Afghanistan strategy, but will vote on it and will push to pass the new strategy. He’ll of course vote for it and I believe it will pass if voted on. Graham concluded by warning his colleagues in Congress, “You will own a no vote. The next 9/11 will be your fault, not President Trump’s fault, if you shoot down this plan.” He’s exactly right here. The only thing that irked me about Graham last night is he started calling everyone ‘general’, which was lame. But other than that, he got it right. John Bolton said his main reservation was that Trump did not call out China on arming North Korea and Pakistan with nukes, which is tied to Afghanistan. I agree on that as well, but I’ll take last night… I was relieved over the speech and thought it was a good one.